A mountain jay playing in the bare branches of the apple tree just outside my office window. I guess everybody is enjoying the calm between storms this morning. We have another batch on the way, and then the weekend is supposed to be clear. Now that’s what I’d call a cooperative winter. Yesterday and the day before were pretty wild! The poor turkey flock appeared quite flummoxed in the midst of it all. The wind was blowing so hard that roofing shingles were flying – and the flock clearly was not settled in the trees that were bending with the strong wind. So, they stood – soaked and bedraggled looking in the cleared lot next door, looking all pitiful and as though asking when it was all going to pass. I was a little surprised not to find them beneath my deck, as I know in the summer they can often be found under there in the cool shade. We have received almost five inches of rain in just the last four days. Higher elevations are getting a great snow pack, so our slowed rivers and dried reservoirs will most assuredly benefit from these storms that have lined up and marched through our region for the past few days. The situation in Haiti after the devastating earthquake that struck this month. A recent report we read told of how well-organized Jehovah’s people are down there in setting up the open-air assembly hall at the branch as a base for relief operations for those affected by the quake. They had already distributed over twenty two tons of relief supplies by day five – and the donations and volunteer spirit of the worldwide brotherhood was, as usual, prompt and generous. So far, amongst our brothers and sisters, loss of lives number over one hundred, and there were still some not yet accounted for, so that number could likely increase. What a comfort to know these lost dear ones are safe in Jehovah’s memory. Meanwhile the reality of life for the survivors is a difficult one, and we keep marveling at how fast the response time is for Jehovah’s organized people. It’s always so reassuring to read about how any donations we have contributed are made readily available for use for the immediate need of relief work. More rain. The forecast seems to indicate that’s possible. Meanwhile, we continue to remember the people of Haiti and the rescue workers in our daily prayers. 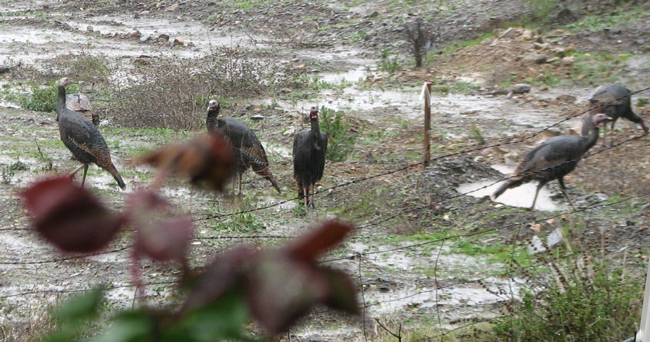 The turkeys look a wee bit bedraggled and hope they did seek shelter. Heart warming news about the helpers. Hope they are able to work safely. Previous post: Foggy morning in the foothills.